Patanjali taught that there are five obstacles, called the kleshas, on the path toward ultimate freedom. This post takes a look at each obstacle and then offers a few self-study prompts so that you can determine which kleshas are keeping you contained in suffering. The truth is, most of us contend with all of the obstacles to some degree or another. It’s helpful, though, to cruise the descriptions and identify which of these is a consistent trap for you. Avidya, or ignorance of our divine nature, houses all other kleshas. According to these teachings, each of us is one and the same with the life force power of the universe, i.e., God, Brahman, or Ishwara as Patanjali’s lineage would name it. Non-purist modern yogis permit a liberal interpretation that says: fundamentally, whether you believe in God or don’t, we are undeniably intertwined with All That Is. Further, separation is an illusion, and it’s belief in this illusion (maya) that causes our continued suffering. Raga, or attachment, is the root cause of much of our human suffering. We attach to each other, to our conveniences, and to our reputations. We even attach to the concept of freedom. According to yoga, we must develop dispassion so that we are not rocked by every little (or major) shift in our external realities. Life is change. The work is to find the part of our consciousness that is unshifting and undisturbed by change. Leaving attachment behind doesn’t mean we don’t do our work in the world, like caring for loved ones, or earning accolades in our field; but it does mean that we carry out these actions while being firmly established in our serene center, equally at peace through success and failure. Oh, the ego. Does it show up everywhere or what? Not unlike attachment and ignorance, this klesha keeps us tightly contained in our own body-mind complex. Ego creates despair and suffering when our separateness, or perceived specialness, gets threatened. The funny thing is, the ego is challenged daily! Still, we fall for its allure. We get protective over our uniqueness. To discharge, or demote, the ego is a radical endeavor, especially for modern-day practitioners who are taught from birth to distinguish themselves and to celebrate their specialness. When the ego is intact it shows up as feeling slighted, insulted, more valuable or worthy than someone else, and just as often, less valuable or less worthy than someone else. It’s sneaky. It’s pervasive. And the path of yoga recommends that we keep a vigilant eye on how it impacts our thinking and actions. On the other end of desire is aversion. At worst, it manifests as active hate. In its least aggressive form, it shows up as a vague feeling of distaste. The yoga system recommends that we take note when aversion crops up into consciousness. We must do the work of self-study, or svadhyaya, and pull this weed out by its roots. Get vigilant is the suggestion. When aversion arises for you, it’s an opportunity to learn something about yourself. Ask in those moments: Why am I reacting to this particular circumstance or person? What is it in me that is inclined to such disgust? As this teaching would have it, we can be rightly opposed to something — an injustice, for example — but we work against it more effectively when we are emotionally unruffled than when we are propelled by a personal antipathy. This one’s pretty clear. Born as we are, and attached to the human form, we fear our own body’s demise and cling to life with all our might. Yoga recommends that we make peace with death while we are still living. To fear death is to deny a fundamental fact of existence — that all embodied forms must expire. The sooner we accept the beauty and reality that all human life eventually comes to an end, the sooner we escape from the fool’s desire to live forever as a small and separate individual life form. Introspection Close your eyes and recall the last time you experienced suffering of any degree. 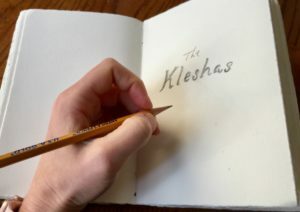 Which of the kleshas most likely caused your pain? Journaling What is the antidote to my suffering or the opposite of this klesha? 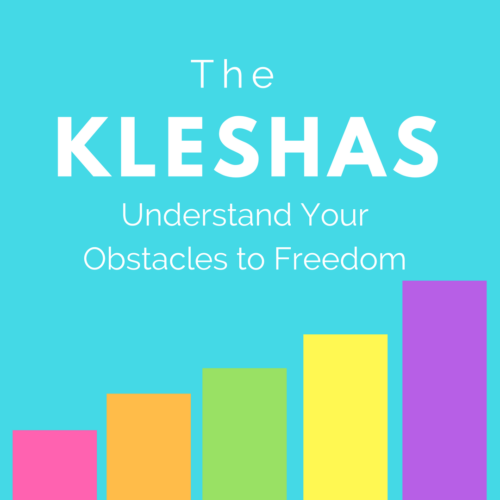 What specific qualities can I cultivate to propel me over the kleshas? Introspection Over the course of your lifetime, has there been a cause of suffering that shows up over and over again? What is this cause? Journaling Is it possible that you are attached to this suffering? Who would you be without this pattern? Are you resisting your own empowerment and deliverance? Introspection It’s common to blame the external world — some person or some circumstance — for our suffering. But yoga teaches that we have access to a peaceful internal abiding, no matter what the external world is presenting to us, if we can just keep getting in touch with our innermost state. For this introspection, identify an external cause of your suffering. Journaling Is there a reason why this external cause is such a trigger for you? What in you is reacting to this external event or person? If it is true that the external cause has no real power to create your suffering, what must you uproot in order to maintain your peace no matter what? Finally, what strategies will you use to remain absorbed in your innermost tranquility even when the external trigger arises? is the work of a lifetime. We will surely stumble here and there, but with continued practice we will also grow. May your ongoing self-study bring you closer and closer to an inner tranquility that is undisturbed by the inevitable tide of external forces.